We all know how the names Simran and Kajol go hand in hand, we all love DDLJ and the iconic Jodi that the movie gave us. Despite the movie being released more than 2 decades ago, we all know how there can be only one 'Raj and Simran'. 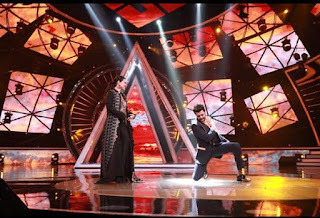 However, when Kajol went to the sets of Indian Idol to promote her upcoming film, Maniesh Paul took no time to step in the shoes of Raj and recreate the iconic moment of DDLJ. It was almost a magical moment on the stage to see Kajol as Simran and a humorous experience for Maniesh to be playing the role of Raj. Needless to say, they killed it on stage! Since team Indian Idol had an iconic actress on the sets, each and every performer paid their tribute to Kajol in some way or the other, but what stole the show was when Maniesh requested to dance with Kajol on 'Gerua'. Kajol happily gave in and the rest is known to all. "Kajol has another vibe all together, it was amazing to have her on sets but to express how it felt like after dancing with her is a very difficult task.. Not only was I overjoyed but also felt blessed for I could share the same platform as her and dance with her on her song," smiled Maniesh. He also shared the picture of the moment on his social media with Kajol and mentioned how it’s his pleasure to dance with the legend, THE SIMRAN and that she is gracious. We couldn't agree any more!